A graphic designer’s antennae are sharp and receptive at all times. You can’t help it. Ugh! You feel, when a particularly inept use of type crosses your vision. Ouch! You go, when an appalling logo slaps you right in the face. Yuk! You say when a piece of smart-arse branding offends your sensibilities. Alistair Morrison was just such a person. It is said apocryphally that when no typesetters in Sydney carried a face he wanted, because it was new, that Morrison hand-lettered all the type required for his beautiful range of Rhine Castle wine labels – I don’t doubt it for a minute. Such was the legend surrounding this remarkable, pioneering designer, painter, writer, intellectual and wit. Harry Williamson met Morrison when he arrived in Sydney in 1959, fresh from the typographic well-spring of the London College of Printing. Harry, no type slouch himself, who probably taught many of those reading these words, describes Al Morrison as “the most advanced typographer of the period”. Morrison was born in Melbourne, attended Scotch College, and was educated at the National Gallery of Victoria Art School from 1925. He was employed in an advertising agency where he had access to diverse publications and became hooked on graphic design and particularly typography. From 1929 to 1933 he freelanced in Melbourne. Brrr, that must have been a chilly experience. Melbourne in the early thirties was no Gay Paree. A dull, complacent big country town, still suffering the mental paralysis of the Great Depression. He must have hankered to be in Sydney where the brightest design was being done. Ah… Sydney… an exotic place to us Melbournians. How the wintry Melbourne designer longed for the warm smell of seagull poo and seaweed. Once there, Morrison formed close friendships with Geoff and Dahl Collings, Gordon and Mary Andrews, Douglas and Maida Annand, and the Missinghams (Hal Missingham, a towering influence on art and design in Sydney in those days, when asked by Nugget Coombs, Governor of the Reserve Bank, to recommend some famous Australian painters to design the forthcoming decimal currency banknotes, told Dr Coombs that he didn’t want painters, he wanted graphic designers. “What the hell are they?” Said Nugget). Al Morrison was one of that breed of Australian designers for whom the world held no fears. The world at the time (I’m talking the 1930’s here) with the possible exception of England, confused us with Austria, and took no further interest. With a gang of Aussie stalwarts, which included the Collings and Gordon Andrews he launched himself onto London during the rumbling prelude to World War Two, and made his presence felt. Morrison would join Dahl Collings at Simpsons of Piccadilly, where she had been employed by no less than Lazlo Maholy-Nagy because he had admired some collage covers she had done for Home magazine in Sydney. Maholy-Nagy and his team which included György Kepes, happy to be out of Germany, and given the chance to practise what they had been preaching at the Bauhaus, were creating the ultimate branding for this groundbreaking menswear store. The building was designed by architect Joseph Pemberton, and pioneered in England a new method of steel welding, previously only seen in Russia and Germany. Nagy in turn, had been employed by Alec Simpson on the recommendation of the great Ashley Havinden, world famous art director of Crawford’s Advertising, who handled the Simpson account. Simpsons were innovators in their own right, Their Daks trousers were the first pants to have a self supporting waistband. Thanks to Havinden’s brilliant visual management of the brand, became internationally famous, and the name went into the English speaking vernacular. We all still know what Daks are. They’re our pants. It’s said the name derived from the Simpson family, who referred to them during their development stages as ‘Dad’s Slacks’. Morrison said that before meeting Maholy-Nagy he had seen no real difference between what he understood to be ‘art’ and what he understood to be ‘design’. Through Maholy-Nagy he became interested in the Bauhaus attitude towards design. After Simpsons, he freelanced in London for clients like Allied Ironfounders, where he became art director for a time, Shell Oil Company, Gaumont British Films, Whitney Straight Airlines, Lund Humphries and the Dorchester Hotel. Blue chip stuff indeed. Morrison returned to Sydney before the bombs started dropping on London, and found Australia more receptive to his work than when he left. He quickly established an enviable client list which came to include the Reserve Bank of Australia, he designed their first five annual reports and their first seven Currency Magazines. His skill as a typographer was impressive under the difficult conditions of Sydney’s inadequate print and type facilities of the time, and he was much in demand for company reports. He worked for the fledgling Industrial Design Institute of Australia, of which he became vice president in 1958. P&O, the prestigious shipping line which prior to the later sophistication of aviation, was the only way to travel. His work for Pioneer Sugar Mills led to a close friendship with the painter, Russell Drysdale, whose family owned the company. They would later work together as advisers to the Reserve Bank on the decimal currency project. He designed a seemingly endless series of advanced catalogues for the Contemporary Art Society, of which he later became president, that stretched from their third annual exhibition in 1941 to their twenty fifth in 1963. A loyal client, even for a president. He did much work for the architectural community on catalogues and brochures for various exhibitions, superb packaging especially for Rhine Castle Wines, branding for Metropolitan Security Services and the National Trust of Australia. He was a tall, lean, Noel Cowardish sort of man, (Mary Andrews’ description) always immaculately dressed, shirt and tie, all that, the sort of man you’d trust implicitly with your annual report, but beneath that elegant, scholarly facade there lurked a deadly and devastating wit which would burst out in 1965 in the form of Let Stalk Strine Morrisons take on the whimsicalities of Australian speech. The story goes that he was present at a launch in Sydney of a Monica Dickens book. Ms Dickens, a British lady, was signing away and a woman, next in the queue said ‘emma chisit’. The author duly dedicated the book to Emma Chisit, and the woman nearly cacked herself and said ‘No luv, I meant emma chisit?’ (how much is it? )… That’s pretty funny, thought Morrison, and went away and created a series of books on the theme, that brought him instant fame, notoriety, and not a little money. From then on he was known as Professor Afferbeck Lauder (Alphabetical Order) and his life changed. Initially he tried to remain anonymous, answering only to ‘Professor Lauder’ when approached for countless press and radio interviews, but Hal Missingham, listening to one of these, jumped up and down and said, ‘That’s bloody Morrison!’ and the secret was out. Not that anyone who knew him was surprised at this turn of events. When names were being bandied about for the new decimal currency, cringemaking suggestions included a ‘Menzies’ (then Prime Minister), a ‘Royal, an ‘Austral’. 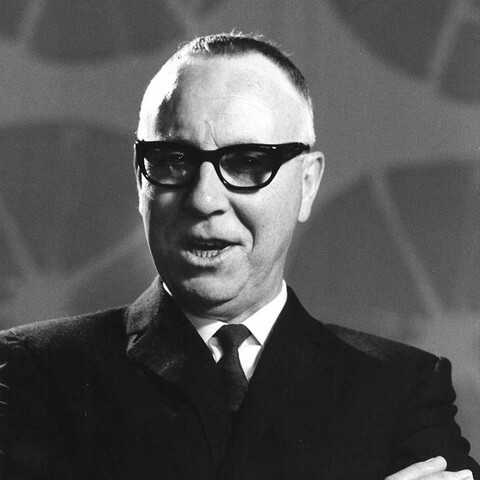 Morrison, in his capacity as chairman of the Currency Note Design Group, (he, Hal Misssingham and Doug Annand had declared themselves unable to accept a design commission, but agreed to act as advisers to the competing four) suggested to the sober bankers that it should be called a ‘Nostril’. That would have given them pause for thought. The Aussie accent somehow is not as funny as it used to be. Multiculturalism has meant we now embrace many different accents every day, and our once unique nasal, mangled way of expressing ourselves has become tempered by time. Morrison’s piercing wit however has impaled a period of our culture, like a rare moth under glass, much as Barry Humphries has. They both put a mirror to our own foibles and fascinated us with our Australianness, and thank God for it, after all those years of being second- hand Poms. This text marked Morrison’s induction into the AGDA Hall of Fame in 2008.